Sorry for the lateness of today's post, I estimate that of the past 24 or so hours, I've been awake only a handful of them..maybe 4? Today's mani is also simple, and I get to use one of my new polishes that I got the other day from ROSS!! (Super cheap, too!) The colors totally remind me of 80s fashion colors, hence the title. I used Color Club Pure Energy from the Electro Candy Collection as a base, with Massini Power Pack applied with a pipe cleaner. Topped it off with 2 coats of Seche Vite top coat. Sorry you're still hurting, I hope you get some relief soon. Is it injury related or stress induced? Anyway, rest and take care. 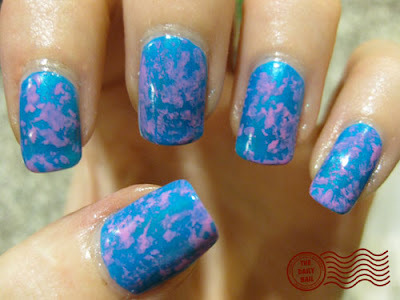 These nails remind me of the water and oil painting backgrounds at concerts way back when. Aww-- I truly hope you start feeling better soon!! You are so awesome for being so dedicated to painting even if you're in pain/under the weather-- and like today they ALWAYS look great. I do have a question: would it be possible for you to maybe include either in your posts or on a separate part of the blog, an "opaqueness score" for nail polishes-- or at least the ones you use most frequently? I know that's a tall order, but for me opaqueness is a big deal that falls only second to chip resistance (which a lot of top coats help take care of). I ask because I bought this pretty teal MatesElite color that even after 3 coats still shows my nail tip. Sometimes its upsetting if a color costs like $10 haha. This is totally 80's style - like Oh my God! HA! It reminds me of acid washed jeans only with pink. My first thought was.. jawbreaker! how do you do the pipecleaner technique?